When I was a child my granddad was a butcher. Unfortunately I was too young to learn the art of butchering an animal from him but I did take a few things from it. Outside of the obvious appreciation of good meat the things that stick in my mind the most are a trip to the abattoir and its huge basket of complete with eyes cow skulls outside (I’ll have to try look out the photo of that one), the huge walk in freezer full of sides of beef and half pigs and, and this is my favourite of them all, making sausages. I was probably younger than 10 when I made my first sausages. The machine my granddad had was a huge red enamelled cast iron thing with foot pedal control and I remember struggling with the speed at which the filled skins fired through your hands when you depressed the pedal. The big coils of sausages you could make were so much more impressive than links of bangers everyone else had too. This love of bangers had stayed with me and as well as making the occasional sausage myself I always seek out any interesting sounding local sausages when I’m away on holiday. This was no different when I was in Sölden, Austria snowboarding last week. When away I pretty much exclusively eat local food, the only real exceptions are one McDonald’s cheeseburger (I like to compare the McDonalds of the world) and if I’m travelling as a group and have to succumb to the boring tastes of my travelling partners. On the last night in Austria we ended up in a fairly local establishment and looking through the local specialities a starter that stood out was ‘Saure Wurst – a local sausage with vinegar and onion’. Once I’d read this my mind was filled with images of some kind of strange preserved sausages, like those little wild boar sausages in jars of olive oil you see in Italian delis but utilising one of the cured and smoked Austrian delights I’d had many times before. How disappointed was I when a plate of sliced pink meat paste with washed out flavourless onion scattered over turned up. To think folk around the world have the audacity to moan about British sausages. It wasn’t actually too bad, but then I don’t mind a bit of Spam or luncheon meat and raw onion is quite tasty stuff. To start with this plate of food is doing the country’s cuisine, or the region of Tyrol’s cuisine at least, a bit of a disservice though. It may be far from my favourite but there are some nice dishes available. 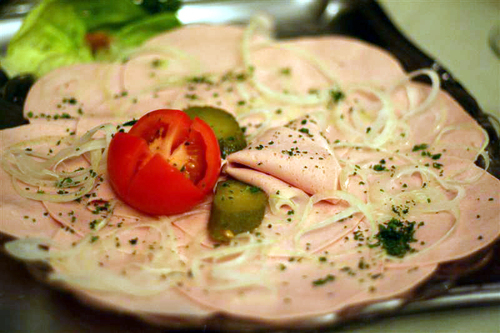 One of the finest of the week in fact was the main that followed this sausage starter – schweinhaxen. This shank of pork had been stewed until the skin was gelatinous, the fat buttery soft and the meat melt in the mouth – textures that a lot of the time seem to be shunned by the lean meat modern palate. 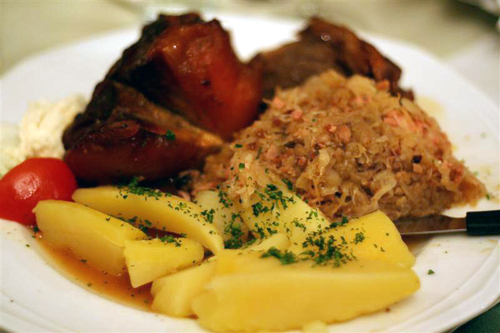 It was served with sauerkraut whose sour, fermented taste had been given a boost with chunks of smoked pork. These two didn’t need a lot more and the boiled spuds' blandness were perfect for their richness. The Tyrol is a mountainous region, cold and snowy for half the year even with its southerly location, and this is reflected in the heartiness of the cuisine. I love to travel. The older I get the more I want to see the world, experience different cultures and experience the food. These last few years I’ve been pretty lucky and been to some amazing places. The most recent of these was Peru. When we planned to go to Peru the last thing on my mind was food. Everyone knows why you go to Peru and that’s to see the Inca remains, to walk the Inca Trail and visit Machu Pichu. If you’ve got time you also visit the birth of the great Amazon River and if edgy urban sprawls are your thing spend a few days in Lima. I’d resigned myself to this year’s holiday being a bit of a culinary desert, yes I’d get to eat some guinea pig and a bit of llama but as far as the cuisine went I wasn’t expecting a lot. The flights were booked way back in February though and the more I started looking into the place the more I noticed food being mentioned. Seemingly I was way off the mark. Whether it was ceviche, causa, chicharrones, anticuchos or lomo saltado everyone that had been spoke highly of Peruvian food. They also spoke of a national obsession with the country’s cuisine rating it right near the top of world when it came to food. I could, and probably will, write about Peruvian food for a long time and have lots of photos of the various dishes to back up my ramblings. 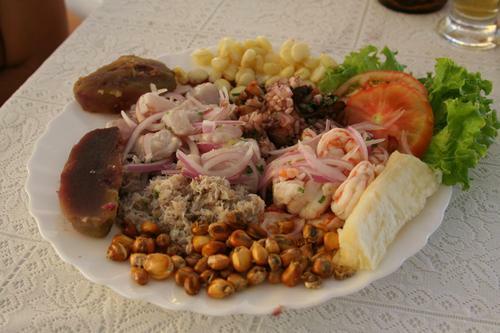 I think the number one dish in Peru though is ceviche and so that is where I shall begin. Ceviche is nothing more than seafood, for the most part raw but sometimes cooked and cold, which has been marinated in citrus fruit juice. If this seafood started off raw then the citric acid effectively cooks it, denaturing the proteins and changing it from translucent raw to opaque cooked in appearance. This is then mixed with red onion and chilli and normally served with the giant Peruvian corn, called choclo, and some cold boiled potato.